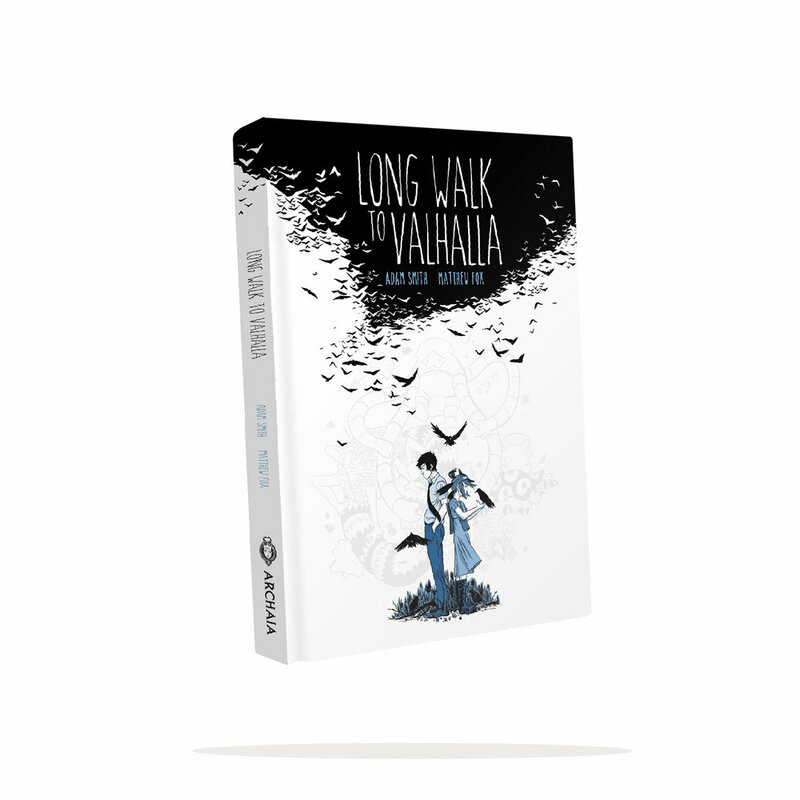 Overview: Hardcover and book design for Eisner nominated series Long Walk to Valhalla. Synopsis: A lyrical Southern fable exploring loss, family, and what it means to truly come home. Rory meets a young girl named Sylvia, claiming to be a Valkyrie sent by the Norse god Odin to deliver Rory to Valhalla. They take a trip through his memories and force him to face a dark truth buried in his past. Design Brief: Design a logo, front and back cover, and interior design for this graphic novel. Role: Cover art direction, logo design, cover design, book design, print production. Project scale: Hardcover graphic novel with spot gloss finish. Final casewrap design for the Long Walk to Valhalla hardcover. Long Walk to Valhalla is a story that came to BOOM! with great potential from an up and coming artist and writer team. We wanted the book to be a feature release, and feel akin to other best selling titles with similar story style and art. The interior art by Matt Fox is beautiful and unique, utilizing black, white, and a monochromatic blue palette. My goal in designing the cover was to feel like a polished display of the etherial art and story waiting in the pages. Being able to art direct the cover of a comic book from a blank slate was exciting for me. We asked the artist to draw a spot illustration of the two main characters to feature on the front. Utilizing negative space, I drew a flock of crows (pulling from crows drawn in the interiors) on the top half of the cover, dense enough to nest the title inside. The flock continues onto the back cover, where they transform into blades of grass pulled from an image in one of the interior art panels. The logo is made from a font called The Skinny, with slight alterations and tweaks to feel more handwritten and irregular. One of my favorite aspects of the cover is the illustration of the imaginary creatures from the story. This was another spot illustration delivered by the artist, put on a gloss layer pass when we sent the book to press. The final result is a semi-hidden image, revealed when light hits the gloss just right. Spot illustration by Matt Fox of the two main characters in the color palette features throughout the book. Flock of crows I illustrated as design element to break up space and provide a focal point for the title. Production file for the spot gloss pass. everything in black is printed as gloss on top of the cover. For the interior design, I followed closely to the design set in place with the cover. The credit spreads utilize white space broken up with large images pulled from the story artwork. The colors used in the design are paired down to three, black white, and a soft bllue that matches the art.